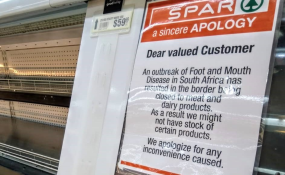 Karan Beef - the continent's biggest player in the Namibian weaner procurement market - has vehemently refuted rumours on social media about it meddling with weaner prices to negatively impact local producers after the outbreak of Foot-and-Mouth Disease in South Africa. Karan Beef director Justin Karan, who was on an official visit in the country, cautions that rumours have never done any one any good in the past and more often than not are used by certain individuals for their own benefits. He says, "Weaner prices are dictated by supply and demand as we are in a free trade country with no quotas or prices been fixed by the regulators". Karan points out that if feedlots are bullish for the 2019 season and they want to grow their herd numbers and weaners are scarce as they were in the 2017 and 2018 season, then prices will stay strong. "On the flip side and the more realistic view, 2017 and 2018 were the toughest years for feeders and the ability to market carcasses at a level which would be profitable was not economically achievable in the country. Clients were chased away and consumer support swung to cheaper protein. I do not have the exact figures with me tonight but the fall in throughput and sales was over 30 percent down." a feeder needs to have a ratio of around 55 percent to max 60 percent on her/his calf to carcass pricing, and that at a stage in 2018, this was over 85 percent. "A Grades are going around R42 per kg, so you can work out where the calf price should be for us to still be in business. Farmers need to see the bigger picture in the long term survival of the industry, not just the freak year we just came out of where they almost doubled their unit costs on calves sold compared to two years back," he concludes. The feedlot giant, which operates the largest cattle feedlot and abattoir on the continent, entered the Namibian weaner procurement market at the end of last year. Namibian weaner exports to South Africa decreased from 219,000 in 2017 to 210,000 exports in 2018 and Karan Beef is committed to make full use of the Namibian weaner situation, and give local producers a much needed outlet and shortening the value chain which will result in better prices for producers. The company has been welcomed with open arms by both the Namibian government and all role players in the industry. Karan Beef has already started buying Namibian cattle via agents, the auctioneering system and also privately from farmers. Karan Beef processes 2,040 head of cattle daily and debones up to 300 tonnes of meat a day and South Africa is its biggest market, with significant exports to UAE, Kuwait, Qatar, Bahrain, Oman, Jordan, Egypt, Mauritius, Seychelles, Maldives, China and Hong Kong.